You will find here some custom presets to use with the Blue Cat's Axiom product. Description: A series of 10 presets for guitar and more, as described in Robert Randolph's Axiom Presets tutorial. Description: A pack of presets to sound like Slash and Izzy on Guns'n Roses "Apetite For Destruction". Presets explained and demoed in this Guns'n Roses Guitar Tones Video. 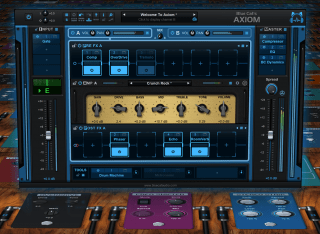 Description: Modern Metal Presets for Axiom. Audio demos available here. Description: A pack of presets to sound like Iron Maiden in "The Trooper". Full tutorial and demo in this Iron Maiden Guitar Tones Video. Description: Clean jazz, crunch and lead presets, as demoed in Martin Miller's Axiom Guitar Video. Description: Three "Gilmourish" guitar tones inpired by David Gilmour's performance in Pink Floyd's "Shine On You razy Diamonds". Full video tutorial here: Julien Bitoun's Shine On Guitar Tones Video. Description: Three presets to sound like Steve Stevens in Billy Idol's "Rebel Yell". Full tutorial and demo in this Steve Stevens Guitar Tones Video. Description: Three vintage guitar tones emulating VOX AC30 amps, as shown in Julien Bitoun's Vintage VOX Video. Description: Three "plexi" style vintage guitar tones: two rhythm sounds and a lead tone that work well together in a mix, as shown in Julien Bitoun's Vintage Plexis Video.